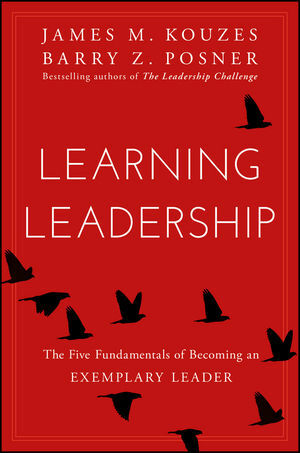 James M. Kouzes and Barry Z. Posner have written a new book that examines a fundamental question: How do people learn leadership? How do they learn to become leaders? Learning Leadership: The Five Fundamentals of Becoming an Exemplary Leader (ISBN: 978-1-119-14428-1; Wiley; May 2016) is a comprehensive guide to unleashing the inner-leader in us all and to building a solid foundation for a lifetime of leadership growth and mastery. The book offers a concrete framework to help individuals of all levels, functions, and backgrounds take charge of their own leadership development and become the best leaders they can be. Arguing that all individuals are born with the capacity to lead, Kouzes and Posner provide readers with a practical series of actions and specific coaching tips for harnessing that capacity and creating a context in which they can excel., Supported by over 30 years of research, from over seventy countries, and with examples from real-world leaders, Learning Leadership is a clarion call to unleash the leadership potential that is already present in today’s society. Believe in Yourself. Believing in oneself is the essential first step in developing leadership competencies. The best leaders are learners, and they can’t achieve mastery until and unless they truly decide that inside them there is a person who can make and difference and learn to be a better leader than they are right now. Aspire to Excel. To become an exemplary leader, people have to determine what they care most about and why they want to lead. Leaders with values-based motivations are the most likely to excel. They also must have a clear image of the kind of leader they want to be in the future—and the legacy they want to leave for others. Challenge Yourself. Challenging oneself is critical to learning leadership. Leaders have to seek new experiences and test themselves. There will be inevitable setbacks and failures along the way that require curiosity, grit, courage, and resilience in order to persist in learning and becoming the best. Engage Support. One can’t lead alone, and one can’t learn alone.It is essential to get support and coaching on the path to achieving excellence. Whether it’s family, managers at work, or professional coaches, leaders need the advice, feedback, care, and support of others. Practice Deliberately. No one gets better at anything without continuous practice. Exemplary leaders spend more time practicing than ordinary leaders. Simply being in the role of a leader is insufficient. To achieve mastery, leaders must set improvement goals, participate in designed learning experiences, ask for feedback, and get coaching. They also put in the time every day and make learning leadership a daily habit. Kouzes and Posner offer unrivaled insights into what it means to become an exemplary leader in today’s world with their original research and over 30 years of experience studying the practices of extraordinary leadership. They show that anyone can become a better leader if they believe in themselves, aspire to excel, challenge themselves, to grow, engage the support of others, and practice deliberately. Learning Leadership challenges readers to do the meaningful and disciplined work necessary to becoming the best they can, using a new mindset and toolkit that can make extraordinary things happen. It’s not the once-in-a-while transformational acts that demonstrate leadership. It’s the little things that one does day in and day out that pave the path to greatness. JAMES M. KOUZES is the Dean's Executive Fellow of Leadership at the Leavey School of Business, Santa Clara University, and lectures on leadership around the world to corporations, governments, and nonprofits. BARRY Z. POSNER is the Accolti Endowed Professor of Leadership at the Leavey School of Business. An accomplished scholar, he also provides leadership workshops and seminars around the world.